Welcome to HD on the Bike 2019! 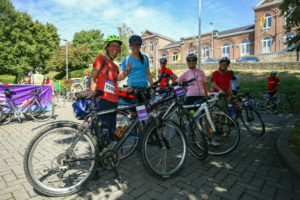 Last year we managed to gather 40 bikers in Liège, Belgium. This year we want to be even more! If you think a bicycle race sounds a bit scary, we promise you: it is not. Bike at your own tempo, rent an electric bike – our goal is to get together and have a lot of fun! During the race we will ride together as the fantastic team we are. Our only criteria is that you want to tear down the stigma surrounding Huntington’s Disease. The race will take place in Frankfurt, Germany 1st of May 2019. It is called ŠKODA Velotour and more than 5,000 amateur cyclists will participate. Group – Join our facebook group to share training practices etc.